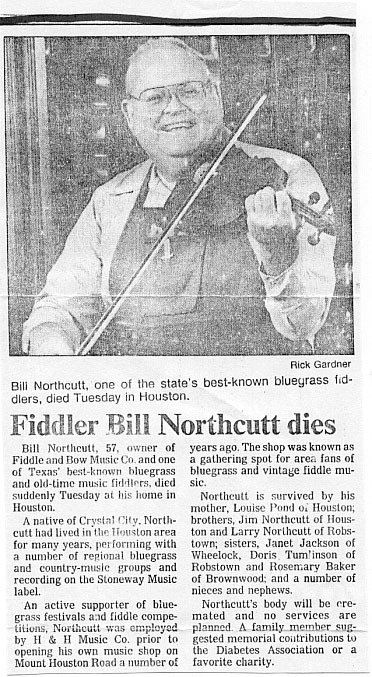 I had the privilege of playing tunes with Bill in the early 1980's, when I was just starting out learning the fiddle. A bunch of us would get together at a bar/restaurant every Wednesday in the Montrose area of Houston and we would play until around 2:00 AM. They gave us free beer for as long as we felt like playing. That made it tough getting up for work the next morning. As the years go by, I find myself returning more and more to the tunes I learned from Bill during the short time I got to play with him. Bill passed away on October 6, 1992. My friend Barry Cooper in Houston sent this to me.